As with lipstick, I tend to stay on the dark side with my nail polish, year-round. Here’s a peek of my polish collection – as you can see it’s mainly greys, blues, deep wine, purples……. https://instagram.com/p/zSL1FVr_h2/?taken-by=wonderlustinglynda Every once in a while though, I fancy something bright and pretty. And so into my nail life twirled these two shades from Nailberry. 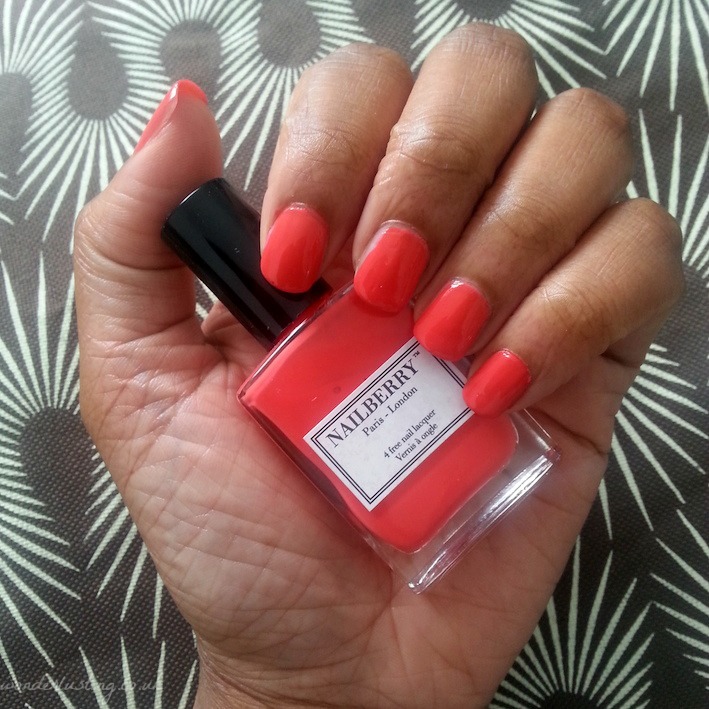 Nailberry is a 4-free (made without formaldehyde, toluene, DBP and camphor) nail polish collection, created by French-born Londoner and entrepreneur, Sonia Hully. There’s also a Nailberry salon in South Kensington which I’ll check out in the future. I’m still trying to find a London nail salon to match Olive and June. Groseille*, Nailberry Groseille is a bright warm coral that is almost neon in the sunshine. This colour screams summer and will look fabulous on my toes. 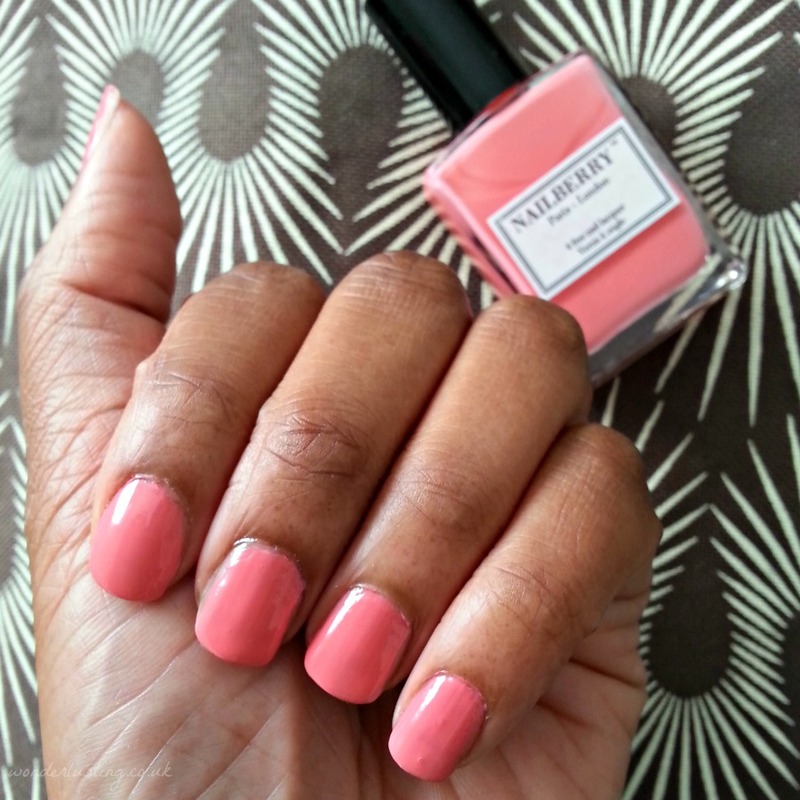 Young & Fabulous*, Nailberry Young & Fabulous is a salmon pink with a hint of coral. This colour is a bit too sweet and pretty for my taste but I could see it looking great on others. The Nailberry polishes are rather runnier than I’m used to, meaning it’s easy to overload the brush and flood your nails. The instructions do recommend that the polish be applied in thin layers so you need to be careful. Though a thinner liquid, it is packed full of pigment and two coats will give opaque coverage. I was particularly impressed with the performance. Firstly, the polish dried really quickly without a top coat. About 10 minutes after painting my nails, I had an unshakeable urge to scratch my head and was sure my nails would be a goner but they stayed pristine with no marks. In terms of wear, my right index finger chipped on day three but I did apply thicker layers than recommended for the best results. With a touch up, my manicure lasted a full week before further chipping and minimal wear at the tips. 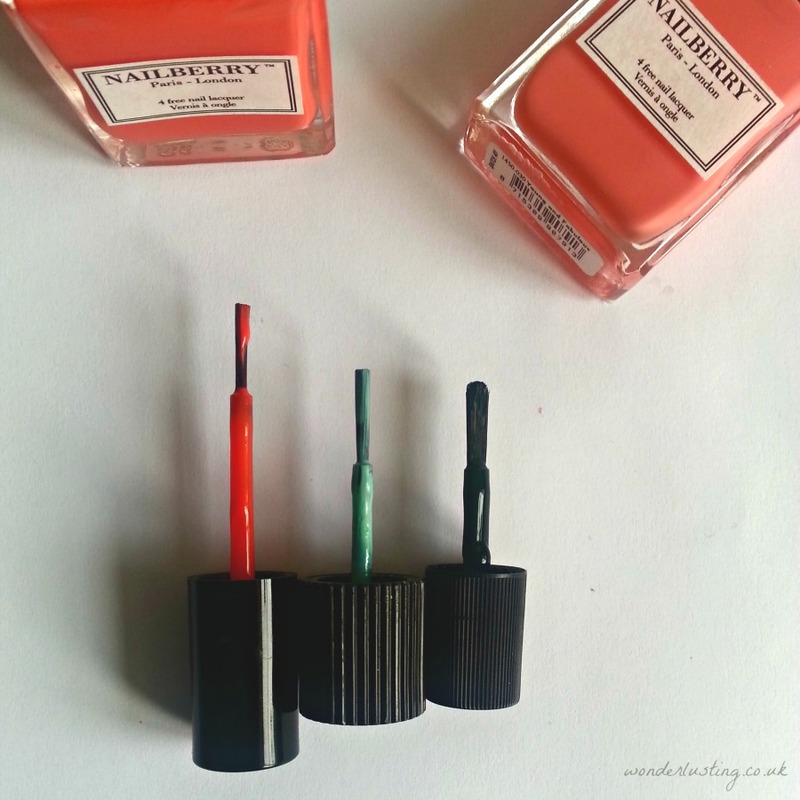 Coming in at £13.50 a pop, Nailberry is not a budget buy but it is a quality boutique product. There are now so many great 4-free and 5-free nail polish options it makes me wonder why all nail polishes aren’t. These look great on you. I love Nailberry vanishes and the were factor is very good. Thank you. I’ve just been admiring the gorgeous aqua colour on your IG. Is the Oxygene formula noticeably different?